4. Who would win a contest of creepiness: Egg Fu or Marvel's MODOK? 5. With the return of Egg Fu and the return prominence of Giganta, Ares, The Cheetah, Circe & Dr. Psycho, can we all agree that Wonder Woman finally has a Rogue's Gallery worthy of her stature in the DCU? 6. Doesn't this just make you all giddy that Gail Simone is going to be able to tap into that on a monthly basis? 11. All of this "Lightning Saga" craziness was to get him back?!? 12. On the last panel of this week's Justice League of America, whose face is that in the lightning rod? 13. Looks to me like, maybe, New Earth got the wrong Flash and Earth-One got the right one, huh? 14. Can we send Linda Park and the twins back? 15. So does this mean that Batman won't be disappointed for too long in The Flash's return? 16. I mean, how can one have an All-Flash #1 without Barry Allen? 18. Huh. Was that Bart eulogizing himself on the last page of The Flash: The Fastest Man Alive #13? 19. Is that some kind of clue? 20. 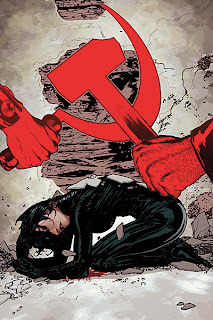 With Catwoman fighting crazy ex-Soviet super-villains and other insanities, why the HELL aren't you reading Catwoman? 2. It's nice, isn't it? I first noticed it in Amazons Attack #2. You know, in all the Flash hullabaloo, I overlooked DC's most innocent explanation. They're not saying "DIE BART DIE," they're just speaking German! So the DC editors are those creepy little gremlin guys from Green Lantern? the real Bart will reappear in all flash 1 calling himself impulse again,..
really, honest, I am not just making this all up because i don't want Bart to die. #3. Grant Flippin' Morrison, that's who! Oh, in their right mind? Hmm.. that's a toughie. Nothing about the Douchbaggery on display in Aquaman? Nor the gruesome and hilarious ending? where does having someone bite your face off rank on the Rolling Head of Panta Scale of Comic Book Violence? Catwoman is the only character in the bat-clan that I do read (or care about.) The credit goes completely to Will Pfeifer and Pete Woods. I'm withholding judgment on Simone going to Wonder Woman until I see how it actually works out. I really don't want to see WW saying things like, "I'm gonna kill ya up." I'm okay with them killing Bart, if only because because they've spent the last 4 years systematically removing everything that was ever appealing about the character. As for Wally, I hope he's more in line with the JLU version now. "14. Can we send Linda Park and the twins back?" 20. Because, frankly, I've only ever been interested in Catwoman when she was voiced by Adrienne Barbeau. #5 -- Bring back Villainy, Inc.! Blue Snowman! Cheetah! Doctor Poison! Eviless, the Slaver from Saturn! Giganta! Hypnota! Queen Clea! Zara, Priestess of the Crimson Flame! Now that's a damn rogue's gallery.